WHAT DID JOHN OKELLO ACTUALLY DO? 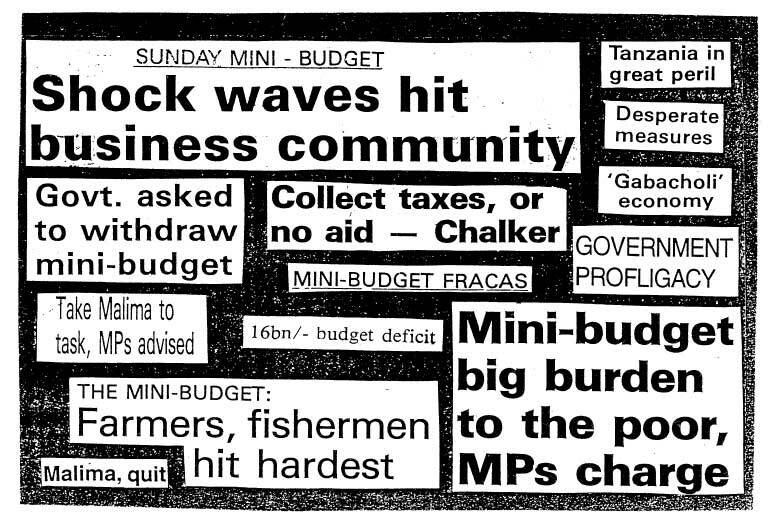 Finance Minister Professor Kighoma Malima shocked Tanzanians on January 2nd 1994 when he announced a series of drastic measures in a mini-budget designed to balance government income and expenditure and deal with a serious shortfall in revenue. He proposed to cut expenditure by no less than 40%. In the following article Roger Carter explains the background to the financial crisis and the measures the government is taking. In common with other Countries at a similar stage in development, Tanzania is faced by a continuing conflict between important long term interests and urgent short term necessities. There can be little doubt that the expansion and enrichment of primary education and the extension of primary health care are among the prerequisites of rapid economic growth. The road and rail systems need radical improvement, the telephone network to be more reliable and responsive. Much capital investment of this kind, for example on schools, health centres, or roads, brings in its train new charges on the recurrent budget for the purposes of operation and maintenance. But it is these costly services that are being starved of resources on account of the pressing need to balance the budget and to bring down inflation. Inflation has immensely damaging consequences. As wage increases lag behind price rises, inflation impoverishes the wage earning section of the population and may well cause social unrest. As an indicator of the government’s inability to fund its expenditure out of revenue, inflation undermines investor confidence both at home and abroad. Inflation introduces uncertainties into all forward planning and complicates the task of exporters. As inflation means that the value of the currency is falling, bank balances and contracts denominated in local currency lose some of their value and saving is discouraged. The importance of controlling inflation has been acknowledged in successive budgets. One major cause of inflation has been the willingness of the government and the National Bank of Commerce to finance the deficits of lossmaking parastatals, notwithstanding warnings by the government that the practice must end. Having no idle surpluses, the government and the Bank have been obliged to rely on inflationary measures involving the creation of new money to meet this need. There are of course circumstances in which a parastatal is providing an essential service and cannot be replaced in the short run. In the case of some crop parastatals the first step has been to remove their monopoly powers and to expose them to competition. Survival then depends on the ability of these parastatals so to reorganise themselves as to operate efficiently without government subventions. The government has set up a Parastatal Sector Reform Commission to advise on the future of parastatals generally, whether by reorganisation as joint venture companies, outright sale to the private sector, or in some cases liquidation. In this matter the government is guided by the intention in the medium term to divest itself of direct responsibility from all productive enterprises. The immediate goal, then, is to end support for loss-making concerns and to balance the budget without resort to borrowing from the Bank, or other inflationary devices. Unhappily, this aim has received a setback with the discovery for the second year running of a serious shortfall in revenue, notwithstanding measures announced in the budget speech to enhance collection and improve motivation among collectors. It was estimated that income by the end of the financial year on 30th June would be some 12% short of the budget figure of Shs. 235.6 billion. Expenditure was also running ahead of estimates. A major cause of the shortfall in revenue is believed to have been inadequate collection of customs duties and steps have been taken to ensure strict adherence to the customs tariff and to put an end to illegal import practices. Increases in customs duties on commodities otherwise produced locally were announced and a 10% duty on industrial raw material, lifted in the budget, was reimposed. On the expenditure side, a decision to undertake the phased closure of 12 embassies and to begin the process by a reduction of home-based and local staff was announced. Foreign visits by government officers funded by government and all transfers of civil servants were suspended. Departmental accounting officers were to see that budget provision was not exceeded; cheques and warrants not covered by balances into the Paymaster General’s account would not be honoured. The government hopes that these measures will restore revenue collection to the level foreshadowed in the budget without significant damage to current economic reforms. Understandably the reaction of the trading community was one of shock. Some of the increases in duties, such as those on drugs from 10% to 40%, were seen as favouring the rich, while the proposed 10% duty on industrial raw materials was a setback for the domestic economy. Representatives of the Confederation of Tanzanian Industries and of the opposition party CHADEMA led by Mr. Edwin Mtei, the former Governor of the Bank of Tanzania, took the view that the budgeted revenue target would be reached if adequate steps were taken to deal with tax evasion and corruption. The government’s proposals met with a hostile reception in Parliament. Summing up for the government the Minister for Finance announced reductions in the rates of duty previously announced. Imported drugs were now to face an import duty of 15%, while duties on raw materials used for the local manufacture of medical and veterinary drugs were to be limited to 5%. Any substantial increase in rates of duty must have two adverse consequences for the economy. First, it is likely to create difficulties for industrial concerns already experiencing cash flow problems, with a risk of insolvency in some cases. Secondly and more importantly, by increasing costs it will tend to put up the rate of inflation and in this way to frustrate a primary object of government policy. The government is aware that morale in the public service is just as important as fiscal changes. Rewards in the public service are now much too low as a result of the decline in the value of the currency and the result has been a tendency towards poor performance, absenteeism, and unpunctuality in an environment offering temptations for corruption, while overstaffing has created a financial burden well beyond the government’s means. It is planned to reduce the size of the service during the current financial year by 20,000 civil servants, taking advantage of the progressive reduction of government responsibilities in the productive sector. It is expected that it will be possible to create a more adequate salary structure when the public service has been reduced to a more sustainable size. In spite of these problems Tanzania has been able to record some notable achievements. The administration of foreign exchange under the supervision of the Bank of Tanzania is going well. The rehabilitation of the road network is proceeding with energy. As a recent World Bank report shows, agricultural production has been increasing at an average annual growth rate of 5.3% between the years 1987 and 1991. Associated with this rate of growth has been an 8.3% real increase in producer prices between 1981-83 and 1989-91, followed by further increases in subsequent years. The ending of the marketing monopoly of the National Milling Corporation has given farmers direct or indirect access to local markets and cash on the nail instead of the long, discouraging delays in payment that previously often prevailed. An important consequence of the rise in rewards for agricultural producers has been a wider dispersal of the proceeds of production among the population in general. So in spite of immediate problems all is not gloom. But the revenue crisis has once again illustrated the immense difficulties faced by a country at Tanzania’s stage of development in undertaking the capital and recurrent financing of vital infrastructure and services in the face of immediate demands on resources. Such crises can arise in a variety of ways. In the previous financial year, the government was obliged to resort to inflationary borrowing, as drought had undermined the electricity supply at Kidatu dam, bringing industry repeatedly to a standstill over a period of several months and seriously interfering with tax revenues. Before that, serious floods in the Lushoto and Korogwe areas forced the government to make provision for emergency relief. Over all of these unexpected demands on resources hang the increasing needs of a population estimated to be growing at about 3% per annum. 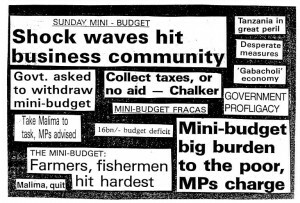 As successive finance ministers have shown, balancing the budget comes high in their lists of priorities. Some of the measures needed to be taken, such as the reduction in the size of the civil service, are inevitably unpopular. But it is clear from the budget speech and its endorsement by Parliament that the nettle has been grasped and that a fall in inflation, bringing with it important benefits both to the economy and the population in general, could now be a realistic expectation. As a reflection of the financial situation some schoolchildren have been protesting violently about the ‘bad food’ being provided in schools – Uqali and beans every day. Ifakara secondary school students have set fire to school buildings and have caused Shs 6 million damage. Kwiru school had to be closed after serious vandalism and 46 students at Arusha school were suspended after unrest in the school. As this issue of the Bulletin went to press reports from Ngara indicated that this district in Kagera Region had suddenly received over 200,000 refugees fleeing from Rwanda. The exodus was described as the largest and fastest the United Nations had ever seen in Africa. Every hour 10,000 refugees were said to be squeezing across the two-lane border bridge at Rusumo. The exodus followed the deaths of Presidents Juvenal Habyarimana of Rwanda and Cyprien Ntaryamira of Burundi on April 6th when their plane was attacked by gunfire at Kigali airport. This was immediately after they had attended a meeting in Dar es Salaam with President Mwinyi who had been acting as Rwanda peacemaker for many months. They had chosen to travel together in the same plane because the Rwanda president’s plane was faster. The Times later reported (May 9th) that the world’s largest refugee camp had been established at Benako, Ngara District, and had soon become ‘a broad colourful canvas of humanity, testament to the tolerance and dignity that Africans, faced with wretched injustice, somehow muster. This seething mass of humanity passes relentlessly up and down the two roads that pass the camp, concentrated around convoys of 20-ton lorries, Toyotas and Landrovers, dispensing what the international community has to offer. Tanzanian Red Cross workers, screaming through megaphones, order the Wakanbizi (editor Wakimbizi?) -refugees-into rows 100 ft deep. In the sun the scenes are jovial but in the rain Benako’s mud oozes beneath the leaden skies and a hellish medieval misery descends’. The paper reported that ten planes crowded with journalists had arrived at the tiny Ngara airstrip in one morning. The manager of an Italian engineering company helping at the airport watched in dismay as a huge CNN charter plane shuddered across the mud and dust strip. “This cannot go on” he said. “With all the termites, this airstrip will soon look like a gruyere cheese”. Refugees at the camp reacted angrily when one of the journalists closed in on a semi-conscious woman who was slumped at the front of one of the long food queues. The Tanzania authorities had begun setting up hundreds of tents to accommodate extra police. Engineers from Medecins sans Frontieres were said to be working round the clock on a pipeline to the Benako camp in an attempt to stop refugees tramping through the quagmire to get at the only source of water, a murky lake nearby. It was estimated that up to half a million gallons of water were needed per day for the refugees. Speaking to some of those Rwandans who had escaped to Ngara, Charles Kizhiga, in the Dar es Salaam Daily News, quoted them as saying ‘We have lost faith in any form of government ..our country should be governed by a strong foreign army, not Belgians or French, and they should stay until two generations pass’. On April 27th it was reported that 70 Rwanda and Burundi nationals in Mwanza region, who had celebrated the deaths of the two presidents at a party at the New Mwanza Hotel, had been arrested on the orders of Prime Minister Malecela. The celebrations had angered Tanzanian residents in Mwanza where flags were flying at half mast. Tanzanian Director of Public Prosecutions Kulwa Masamba later stated that it was not a crime in law for someone to celebrate another persons death. Since multi-partyism was introduced in Tanzania there have been three parliamentary by-elections. The first, at Kwahani in Zanzibar, on April 19th 1993 (Bulletin No 45) was an easy victory for the CCM. The party took 89% of the vote. The second at Ileje on January 30, 1994, following the death of the late Minister Stephen Kibona, was slightly more difficult although the opposition reduced its chances by entering no less than six candidates; but again it was an overwhelming victory for the CCW which gained 78.5% of the votes cast. But when the Kigoma Urban seat fell vacant things were different. CCM had chosen a wealthy Asian businessman as its candidate; the leading opposition party CHADEMA had nominated a university lecturer, regarded as a very strong candidate. The CCM knew that it had a fight on its hands. Reactions to the two latest results varied from the euphoria of the CCM to disappointment and frustration on the part of the opposition. CCM MP’s meeting in Dodoma were jubilant on hearing the Ileje result. A few days later when the victor arrived in Dodoma he was garlanded with a scarf and then mobbed and hugged by fellow MP’ S and youth wingers. But the Kigoma Urban by election campaign had by then reached what was described as ‘fever pitch8 and CCM was pulling out all the stops. It threw in most of the top leadership including President Mwinyi himself. The CHADEMA team was lead by Party leader Edwin Mtei. Opposition supporters were critical of the election procedures especially at Kigoma where CHADEMA decided to petition the High Court, appealing against the result. There has been particularly strong criticism of Radio Tanzania for its alleged biased reporting – criticism shared apparently by the Electoral Commission. The CCM’s very high profile campaign at Kigoma was alleged to have used government funds, offices and officials. There were complaints about the use of the government jet for President Mwinyi’s visit; the use of substantial funds to resurface Kigoma roads; donations by the CCM candidate to the local people; the temporary arrest of the firebrand government opponent the Rev. Mtikila as he was heading to Dar es Salaam airport on his way to Kigoma. Professor M Baregu, writing in the ‘Family Mirror ‘ pointed out that the Nyalali Report (Bulletin No 42) had identified 40 pieces of legislation which should have been repealed or revised if an environment conducive to multi-party politics were to be created but that they remained on the statue book. He wondered whether the low voter registration (23,000 registered out of an eligible 80,000 in Ileje) might be linked to this. The Nyalali Commission had recommended the setting up of three bodies – a body to oversee the transition to multipartyism by May 1992, a Constitutional Commission by July 1992, and an electoral Commission. The government had set up only the latter. CHADEMA and CUF, the strongest opposition parties in the mainland and in Zanzibar respectively seem to have taken to heart the clear lesson that the opposition parties must unite if they are to compete effectively with the well-entrenched CCM. They had a joint meeting on January 25th and the CUF did not put up a candidate at Kigoma. Another fairly strong party – the NCCR – Mageuzi party – withdrew from the Kigoma race. The weekly Swahili newspaper, ‘Wakati ni Huu’ reported that representatives of UMD, NCCR – Mageuzi, PONA, CUF, CHADEMA, and TADEA had met in late April to try and work out a joint political strategy but many observers regarded the possibility with scepticism. CCM pointed out that American and Canadian observers had declared both by-elections free and fair. Some CCM officials accused the opposition of racism – the CCM candidate being an Asian – and there were allegations that the opposition had used violence during the campaign and had distributed fake voting cards. CHADEMA – WHAT IS ITS POLICY? The recent deaths of the former Minister of Education and Culture, Charles Kabeho and the MP for Tabora North, Mr H Makololo, mean that there will soon be two more by-elections. The first, at Igunga is to be held on June 19th and the campaign is underway. The United Democratic Party (UDP) has appealed to other opposition parties to give a chance to their candidate – 70-year old veteran politician Joseph Kasella Bantu – and not to split the opposition vote. CHADEMA Chairman Edwin Mtei has threatened to boycott the by-election. Anti-corruption crusader Augustine Mrema, Deputy Prime Minister and Home Affairs Minister, has been told by the Senior Resident Magistrate in Dar es Salaam, Ms Natalia Kimaro, to stop condemning before journalists people facing court charges. The Magistrate pointed out that an accused person is innocent until proved guilty by a court. The case in question has aroused immense interest in Tanzania as it involves six defendants charged with an alleged fraud of Shs 250 million of Open General Licence Funds. But Sweden’s Ambassador to Tanzania, Thomas Palme, is reported to have given Mr Mrema a ‘diplomatic push’ in his efforts to fight the theft of public funds. He hinted that Nordic countries might raise their levels of assistance if an end could be put to misappropriation of funds and the culture under which cuts were demanded when tender awards were being made to foreign companies – Express. The Tanzania Zambia Railway Authority (TAZARA) realised a revenue of Shs 22 billion in 1992/93 compared with Shs 13.2 billion in the previous year. Shs 20.7 billion came from goods and Shs 1.05 billion from passenger services. The net profit of Shs 7 billion compared with a figure of Shs 3.1 billion in 1991/92. Total freight loaded was 1,238,962 tons, an increase of 18% over the previous year. Tanzania is to get loans totalling US$34 million from the Kuwait Fund for Arab Economic Development and the Organisation of Petroleum Exporting Countries (OPEC) Fund in support of the Dar es Salaam – Somanga road project. This is part of the multi-billion dollar Integrated Roads Programme (IRP). The project will include the repair and resurfacing of the Dar es salaam – Kibiti section linking it with the recently completed Kibiti- Ikwiriri section financed by the Saudi Fund for Development. The project also includes the construction of a new road traversing the Rufiji River flood plains and incorporates a 250 metre long reinforced concrete bridge across the river. ‘A Shining Example’, ‘Remarkable’ ‘Exemplary Road Building’ – such are the comments being made by Dar es Salaam’s 2.3 million people as they witness the first phase of the city’s road rehabilitation programme. The Japanese company ‘Konoike’ is the recipient of the praise – it has now completed the reconstruction of some 21 kms of city centre roads – Daily News. Tanzania has sent 800 troops to Liberia to join the OAU peacekeeping force. During a short ceremony held at Dar es Salaam airport, the Tanzania Peoples’ Defence Force Chief of Operations and Training, Brigadier Msuya, urged the group to portray a good image of Tanzania during the entire peacekeeping mission. The troops received a joyous welcome when they arrived at Monrovia’s Springs Payne airport on a plane of Air Gambia – Sunday News. The Tanzania Coffee Board has announced that between 1983/84 and 1992/93 Tanzania exported 503,223 metric tonnes of coffee worth US$1,077,350,000 or an average of US$107 million per annum. Seventy one per cent of sales were to EC countries followed by Finland (11.7%) Japan (9.3%) and the USA (1-2%). The Daily News revealed on its front page on April 28th that one of Mwalimu Nyerere’s closest and longest serving assistants and advisers, 69-year old Ndugu Joan Wicken, had left Tanzania for Britain after a 34-year stay. She said that she was leaving because of poor health. She added “I came to Tanzania as a socialist and I am leaving as a socialist”. She explained that she had always been paid a local salary and never paid as an expatriate. While in Britain she will continue to help Mwalimu in his duties as head of the South Centre which has offices in Geneva and Dar es Salaam. She denied that she intended to write a book. Tanzania’s Ambassador to the UN in New York and former High Commissioner in London, Mr Anthony Nyakyi, has been recalled to Tanzania at short notice a few months before he was due to retire. A new ambassador, Mr Daudi Mwakawago, was formally appointed to the post apparently before Mr Nyakyi left. The White Sands Hotel and several beauty parlours in Dar es Salaam are hoping to revive beauty contests so that Tanzania can be represented in international beauty competitions. Tanzania was said to be the only country in the region that did not have such contests. During an address to mark the 30th anniversary of the Union between Tanganyika and Zanzibar at the Amaan Stadium in Zanzibar on April 26th, President Mwinyi said that draft proposals aimed at ironing out shortcomings and administrative problems would soon be tabled before parliament for discussion. “It is true that the Union has vexatious issues but there is a need to sort them out to enable Tanzanians to move in line with the constitution regulations and procedures” he said – Daily News. The government has closed down six duty free shops, leaving only three still open, in a move to plug loop-holes of foreign exchange leakage. Customs commissioner Masoud Mvuma said that duty free shops were originally intended to enable foreigners to buy items which were not available locally but, that in the wake of trade liberalisation, this was not so necessary as virtually everything was now available in shops – Daily News. Steps taken by the Dar es Salaam City Council to rename a number of streets in the capital have been widely criticised. New names include Nyerere Road (formerly Pugu Road) and Ali Hassan Mwinyi Road (formerly Bagamoyo Road). Adding to the criticism was the action of the Coca Cola Company in donating the new Mwinyi Road sign and attaching their trade mark to it. Senior government officials have complained about ‘prostituting’ the honour of the presidency. Mwalimu Nyerere has reportedly asked the Mayor to rescind the decision because as long as he lived he wanted to live as an ordinary citizen and rejected all schemes designed to erect monuments or relics in his honour. He complained that he had not been consulted before the change was made – Family Mirror. AND WHO IS GOING TO ANSWER THESE QUESTIONS? – who from the Ministry of Foreign Affairs will go to Brazzaville and Rabat to explain why we have removed these countries’ names from our streets? – who will be making a courtesy call on former CCM Vice- Chairman Rashidi Kawawa to explain why such a narrow unworthy street as Kigoma Road has been named after him? – who is going to alter all the hundreds of house plot names that will have to be changed? – how many of us use the earlier list of new names? Sokoine Drive instead of City Drive? Samora Machel for Independence Avenue? EAST AFRICAN BANK GOVERNORS REACH AGREEMENT. Governors of the central banks of Kenya, Uganda and Tanzania have reached agreement on a series of measures on inter-state trade and the removal of currency restrictions. It is not known how long it will take to implement the governors’ recommendations. Speaking at a dinner meeting of the Tanzania-UK Business Group in London, Mr Patrick MC Laughlin, the Minister with Special Responsibility for Africa in Britain’s Department of Trade and Industry, said that Tanzania’s economy could reap big benefits if the authorities dispensed with current bureaucratic practices when doing business with foreign investors. If it did not, “UK Investors would continue to find the pursuit of many opportunities a wearisome task” he said. Among recent investments in Tanzania are the five-star hotel under construction on the golf course in Dar es Salaam (financed by the Aga Khan Fund for Economic Development and Britain’s CDC), provision of a local and international mobile telephone service (Tanzania Posts and Telecommunications and a Malaysian firm, Technology Resources Industries) and a restructuring of the Ministry of Agriculture (Islamic Development Bank). But, Arab and Asian investors have expressed the view that the pace of privatisation has been slow in Tanzania because there are not enough black African entrepreneurs involved to satisfy oldguard socialists who fear a return to market control by ‘outsiders’ – African Business, March 1994. A USAID sponsored Business Services Centre will be opening in Dar es Salaam shortly. It is designed to help the local private sector through a combination of training, advisory and information services – Business News, March 4. Dr. Charles Kimei, Director, Economics and Statistics at the Bank of Tanzania, has stated that Tanzania has embarked on a law to enable the licensing of securities and capital market dealers. “We are looking towards forming a stock exchange in about two years time” he said and added that a public training programme to this end had already begun – Lloyd’s List February 21.
Business Times columnist Joe Dotto has been writing about the recent strikes amongst teachers, medical staff and other workers. ‘Everybody knows’ he wrote ‘that public employees in Tanzania have been on strike for twenty years. The strike began with the famous Clause 15 of the then TANU Party guidelines which threw out of the window the rules of office discipline and overthrew the office boss in favour of the liberation of the workers.. . . .on its part, the government then decided to pay back in kind’. It had started to pay its workers monkey wages – peanuts. A government employee summed up the situation – ” the government pretends to pay us and we pretend to work for it”. AMERICAN MULTI-NATIONAL COMES TO TANZANIA. According to the South African-based Managing Director of P and I Associates (Marine Surveyors) the initial reason why they opened an office in Tanzania before Kenya was the high level of stowaways coming from Tanzania. Once we managed to deal with that problem we found that our services were more in demand from shippers dealing with trade with South Africa – Lloyd’s List February 21. INCREASING IMPORTANCE OF INFORMAL SECTOR. Air Tanzania Corporation (ATC) raised fares and cargo charges for domestic routes by 30% with effect from April 1st because of what the managing director described as the continued depreciation of the Tanzanian shilling against the US dollar and £ sterling. The Dar es Salaam Merchants Chamber has complained bitterly about the government’s introduction of a 2% witholding tax on the private sector because it involves a lot of extra paper work. But the Commissioner of Income Tax has pointed out that parastatal companies have been paying this tax for some time and that the protests probably reflect a lack of a ‘tax compliance culture’. Honest businessmen would be helped because tax would be payable in instalments rather than in a lump sum at the end of the year. 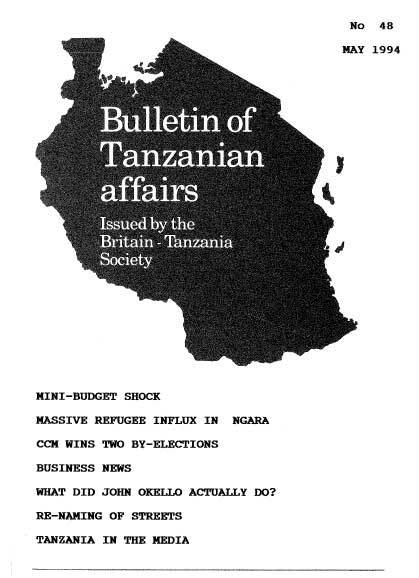 The latest development, as the Bulletin goes to press, is an apparent admission by the Attorney-General, after a request for clarification from the Confederation of Tanzania Industries, that applying the tax to private business would be contrary to the provisions of the income Tax Act (1973). The Government is also said to be considering the introduction of a Value Added Tax to replace sales taxes for industrial and other firms – Business Times. The government has appointed Cotena Inspection SA on a three-year contract to carry out preshipment inspection, tax-collection and monitoring of the tax collection services. The aim is to protect Tanzania’s foreign exchange resources and to increase the amount of customs duties collected. A private indigenous bank – the First Adili Bank – which is to emphasise initially merchant and investment banking is hoping to start operations within the next few months. Officials of the Zanzibar Investment Promotion Authority (ZIPA) and the Zanzibar Free Economic Zone Authority (ZAFREZA) report that some 208 projects designed to generate up to 6,000 jobs have been approved. But most of the projects have not gone beyond the feasibility stage. Consultants have expressed reservations about the idea of turning Zanzibar into a free port because of the lack of a core of local investors, managerial ability and a developed labour force. There was also the possibility of processing zones being established around Dar es Salaam where the environment would be more suitable – Business Times, March 4. A few weeks before her death on January 14th, the very popular and acceptable face of Tanzanian culture in London, Fatma Abdullah (55), Minister Counsellor at the Tanzania High Commission, had been promoted to a new position of ambassadorial rank as chief of the Zanzibar Wing of the Ministry of Foreign Affairs. As an artist she used colour in a rich flamboyant way; in music, her first job in London had been to introduce a Zanzibar taarab group to Europe; she had been a teacher of art and visual aids and had herself trained art teachers; she was a knowledgeable guide for visitors to the Isles, She will be much missed. The Chairperson of the Umoja wa Wanawake wa Tanzania (UWT) died in Moshi on February 11 1994. She was described by Prime Minister Malecela as not only a leader of women in Tanzania but also a fighter for womens1 rights in the whole continent of Africa. At the funeral in Dar es Salaam, as Mr Rashidi Kawawa spoke of their 43 years of married life together, he broke into tears and was consoled by Mwalimu Julius Nyerere. The first television service in mainland Tanzania began operating at the beginning of February. It is called ‘Coastal Television Network (CTN)’ and will cover an area including Dar es Salaam, Morogoro and Zanzibar. CTN is the only license holder of the American CNN and will be able to air local events free of charge. A second TV station owned by IPP has been given a licence by the Broadcasting Commission and is expected to start transmission shortly.